Fall typically means the arrival of things we love, like sweater weather, apple-picking, and pumpkin-spiced everything. Unfortunately for many of us, the colder weather might also mean the arrival of split ends, which leads to dry, frizzy ends and damaged hair if they’re not taken care of with a trim. The good news is you don’t have to fall victim to the dry air that causes them. Why Are Split Ends More Common in the Winter? As the temperature drops, the humidity and moisture in the air decrease significantly, which means there’s little left for your hair to soak up, causing it to turn dry and brittle. This dryness leads to dull hair, breakage, and – you guessed it – dreaded split ends. But all is not lost. There are five easy ways to protect your hair from the winter weather and avoid those frizzy, frustrating split ends. Dry your hair. You might not catch a cold like your mom always said you would, however, going outside with wet hair in the winter can damage your hair. Water expands when it freezes, and when your hair is damp any moisture in it will result in frozen strands. As the moisture in your hair expands, it causes damage to the shafts. Although it’s tempting to stay curled up under the covers longer than usual, winter is not the time to skimp on your morning routine. Make sure your hair is dry before heading out for the day. Seal in Moisture. It’s not just the cold air outside that can wreak havoc on your locks. The warm air pumped through office buildings and homes has the same drying effect on your hair. Use a leave-in conditioner or an anti-frizz product daily to help seal in moisture and protect your hair. Get a Scarf. Wool can be your best friend in the winter, keeping you warm on the coldest days. But the fabric is rough and when you flip up that hood or wrap your shawl around your neck, the rough fabric easily pulls on dry, brittle hair. Use a silk scarf as a barrier between your hair and those adorable wool hats and scarves. Go Natural. Washing your hair less frequently will help avoid stripping it of the natural oils that are so crucial to locking in moisture this time of year. Try purchasing a dry shampoo to help you extend the life of your wash a few more days. Avoid Heat Tools. When possible, avoid using heat tools like flat irons or curling wands excessively throughout the winter. If you are using them, go over the top with heat protection serums to avoid any additional breakage. Above all, remember this key: Hydrate. Hydrate. Hydrate. 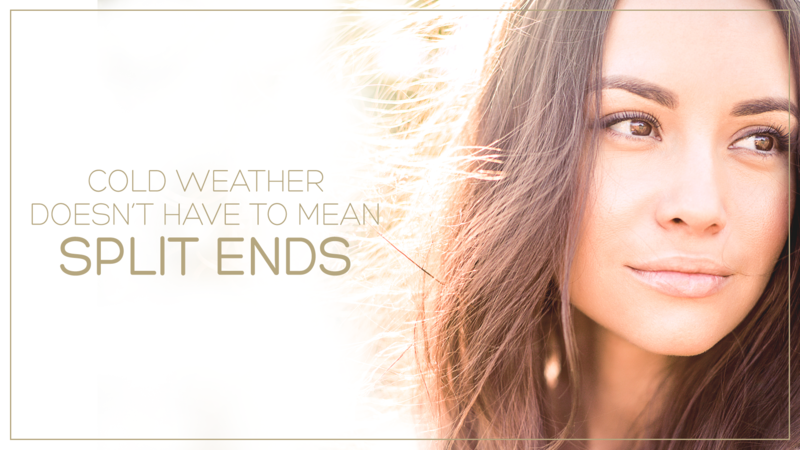 Using conditioners, masks, and anti-frizz or shine serums will help keep moisture in and the dry air out. If you do find your hair is splitting, stop by the salon! We can clean it up with a trim and chat about specific products to help protect your locks. Call Caralyn’s today at 613-224-7206 or book your appointment online.